AAAAAAAAAAAAA YOU ARE THE CLEVEREST PERSON I HAVE EVER SEEN I AM FLAILING A LITTLE BIT AND MAKING SQUEAKING SOUNDS. Dude, I still use your clamps-on-the-blinds method of curtain hanging. Love it!! Will you also be painting the bat another colour so it stands out? you've done it again... gone and blown my mind with your creativeness! Girl, you are really something! I agree-painting the bat would be nice. Thanks! Yes, I think I'll have to try painting the bat. Thanks! I actually went back to Hobby Lobby to get more bats to layer, but they'd sold out. :( I hope to find some at another store location this weekend. Wooooow!! So beautiful!!! doesn't the cardboard makes it look a bit simple? I mean it doesn't look simple at all from the picture but I am just interested. Thank you! I'm not quite sure I understand your question... I used the cardboard for a template/pattern, but the pediment itself is made of MDF (wood). Wow! That is gorgeous! :) And very helpful! It looks amazing! Really classes up the door! Oh my word that looks FABULOUS! I think I want your house...Do you need a lodger? I think maybe paint the bat a traditional black colour because as at the moment it's not immediately obvious that the bat is there. From a distance it just looks like scrolling or something at the top of the door. Yes, I will have to try painting the bat black. I'd originally planned to put small black bats on the corner blocks, so I don't know why I didn't think of painting this bat black. You're so handy and creative. :) I really like the idea and the shape of the bat turned out very nice. Though I agree that it looks like it needed a bit of something to look finished. I think it's the depth – those vertical trims have more depth in their pattern, more than the bat and its background. I might suggest something that would, more or less visually, make the top ends of the vertical trims seem like they were farther away (than the pediment, like they were fully below it). Maybe indeed a thin trim at the bottom of the pediment or something. Another idea, which might not work but I cannot try out if it would, would be adding some decorative quadrangular (but not right-angled) shapes on top of those pillar-like trims, thus also over the left and right side of the pediment... I'm not sure if it makes any sense. :D Anyway, you are extremely creative! Yes, I agree, I think it's the depth. The pediment is too flat compared to the fluted trim pieces. I'll play around with adding some molding or appliques to the pediment to make it look more substantial. If you can do some trompe l'oeil on the bat and pediment in subtle grey tones, that might be just the accent it needs. It's looking great! Oh clever you!! It's amazing!!! Nice that you saw batwings in the door crowns and made your own defined version. It's perfect! This is the wonderful! Utterly fantastic! Many other positive adjectives! I do agree with the some of the other that maybe the bat should be painted. If you don't want it to stand out too much, maybe a light grey? I think you're right about some trim along the bottom of the pediment. I'd have trim up the sides and meeting the bat, too, but that might be quite hard to do. Maybe you could paint swirls either side of the bat? Yes, trim up the sides would look nice. I'd just have to figure out how to make a smooth end/transition where it meets the bat. That is just... just awesome! 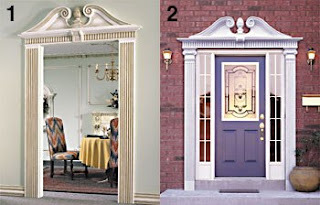 I wanna do all my doors exactly the same!